"Where you can get all of your goodies without the guilt!" Be sure to check back often, more goodies will be added soon. *** Our newest creations, The Bewitched Broomstick Whippet™! Limited time only for this Halloween. These yummy fluffy tarts are light as air but are super strong, extremely authentic and long lasting. ~Spotted Hog Custom Blend~ Brooms are for more than sweeping for this wicked witch. Watch her fly through the night sky and if you’re lucky, you will see her sprinkling Halloween magic below from her sinister cinnamon broom. The true aroma of the favorite holiday cinnamon broomsticks. A sugary sweet and spicy cinnamon essence that is simply bewitching. This XL Whippet™ screams~ I'll get you my pretty and your little dog too. You will receive one Bewitched Broomstick Whippet™ individually wrapped. You will receive one XL Vampires Vanilla Poundcake Whippet™ individually wrapped. *** Our newest creations, The Upside-down Cinnabun Whippet™! This is the way Cinnabuns were truly meant to be eaten. Fluffy rich vanilla frosting with the cinnamon roll gently nestled in the center finished with a sprinkle of real cinnamon sugar. This aroma will take your cravings for the real thing to a whole new level. You may want to have the real thing on hand just in case. These yummy fluffy tarts are light as air but are super strong, extremely authentic and long lasting. **** A Spotted Hog Custom Blend~ NEW and quickly became a best seller! Peach cake swirled with creamy butterscotch chips, iced with butterscotch icing. Think TastyKake butterscotch krimpets meets a slice peach pie. Even if you're not a fan of peach you'll love this one. 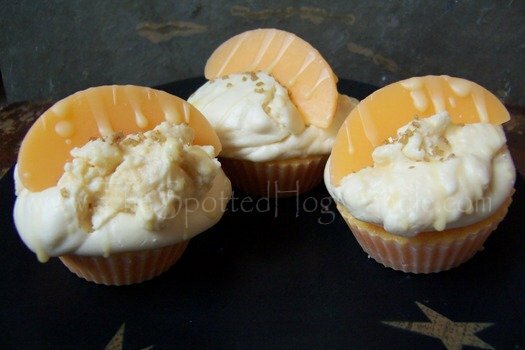 Solid wax cupcake base, whipped butterscotch frosting with a large peach slice on top. Large enough for multiple melts. Top pops off and can be cut into several tarts. Packaged in a cello bag. 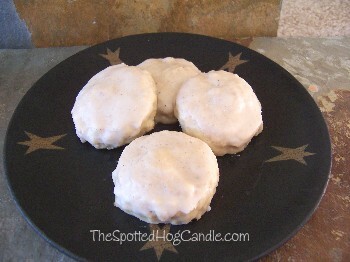 **** A Spotted Hog Exclusive Custom Fragrance~ I fell so in love with the smell and taste of these delicious little cookies that I needed to capture that exact essence in a candle. I mailed the actual butter cookies with a note to one of our fragrance houses that said "This is what a real butter cookie is supposed to smell like and I want this in a bottle, if you can do it, you can eat the cookies, if not I want them back. "I wasn’t kidding and I didn't get those cookies back because our perfumers did an incredible job. 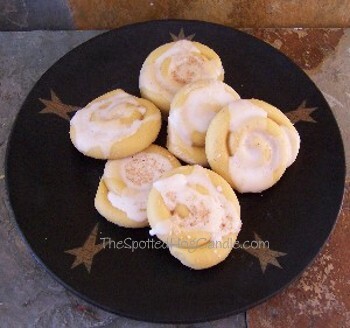 Anginettes butter cookie is a real, true to life bakery iced butter cookie. Not a supermarket cookie… not a toll house cookie….not a sugar cookie. It’s the real thing, exactly what the authentic Italian mom and pop bakery makes. Layered pink and white, with a pink ribbon and pink sugar crystals. Packaged in a cello bag. **** Sweet sugar and layered in sweet and sour notes of various fruits and citrus! Sweet, sassy, fruity and FUN!!. 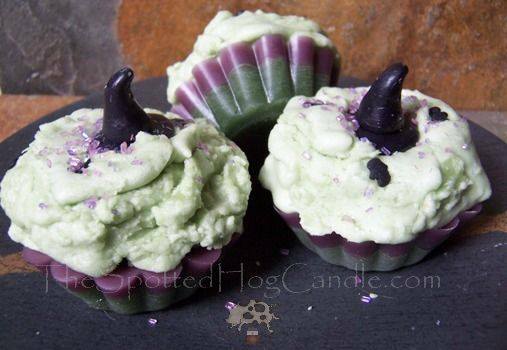 Solid purple glitter palm wax base, whipped frosting and sweet heart tart embeds. Top pops off for 2 melts. Packaged in a cello bag. **** A wonderful blend of rich aromatic coffee blended with caramel, peanuts and rich milk chocolate! 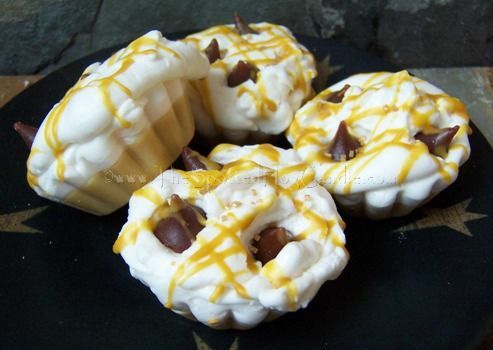 It truly smells like a Snicker's Bar has been melted into your cup of coffee Solid coffee and cream colored base topped with fluffy whipped topping, a caramel drizzle,sugar crystals and chocolate chips. Large enough to cut in half for multiple melts. Individually packaged in a cello bag. ****Poolside Paradise~ A tropical mélange of blood oranges, sweet pineapples, mandarin oranges, a hint of cherry, a splash of sweet vanilla and a dash of zing will give you a taste of poolside paradise. Solid ocean blue base, whipped topping for sand with golden sugar crystals and a flip flop embedded in the top in green,purple,orange,pink or blue. Large enough to cut in half for multiple melts. Individually packaged in a cello bag. **** Dedicated to Linda from Lindenhurst, NY our Candlefind.com contest winner‘s very own whippet creation! Linda chose to combine her very favorite scents and created a beautiful combination of tart Cranberry and juicy Grapefruit. This whippet has a solid cranberry base topped with fluffy whipped wax scented in tart and sugary grapefruit, a grapefruit slice and cranberry embed, a drizzle of vanilla glaze and a light dusting of yellow sugar crystals completes this little slice of heaven.Comes individually wrapped in a clear cello bag and is large enough to cut in half for multiple melts. 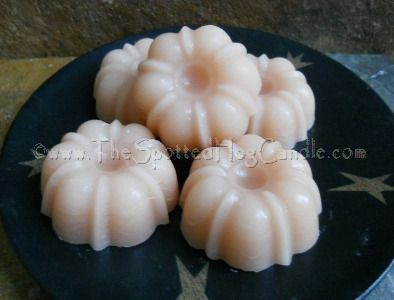 **** Aroma of Macintosh apple dipped in warm thick gooey caramel Super strong and Yummy! Whipped Caramel apples tart base with a square caramel candy and apple slice embed nestled on top, drizzled with even more caramel goodness and raw sugar crystals.Comes individually wrapped in a clear cello bag and is large enough to cut in half for multiple melts. *** Would you like one scoop or two? That is the question you will be asking when you take one whiff of this fragrance. We will take you back to your childhood with the authentic aroma of a freshly baked Sugar Waffle Cone. Whipped Waffle Cone tart, dipped in Chocolate wax and rainbow sprinkles. Comes individually wrapped in a clear cello bag and is large enough to cut in half for multiple melts. 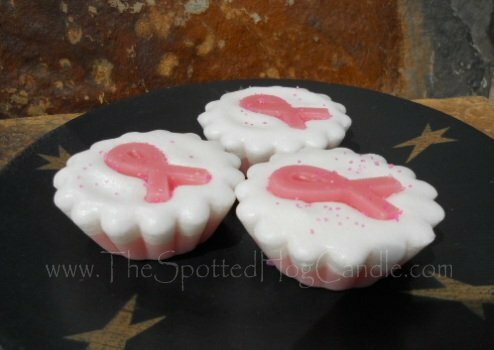 **** Scented throughout in our delicious pink sugar cookies blend. This adorable whippet starts with a solid base colored green and purple to represent her witchy stockings, topped with fluffy melting witch, sprinkled with her naughty trouble making flying monkeys, a dash of purple and green sugar crystals and a smidgen of glitter for dramatic effect. The horror you say, but we all know the story, she had it coming! All that remains of this evil witch is her pointy black hat. Comes individually wrapped in a clear cello bag and is large enough to cut in half for multiple melts. **** Cute as can be and smells delicious! Delicious aroma of freshly baked butter cookies topped with a dollop of tart, ripe strawberry jam. 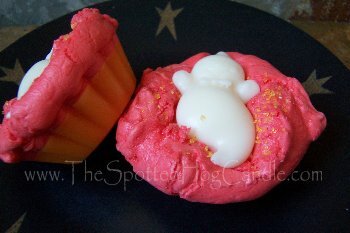 Solid pink base with fluffy butter cookie topping, pink sugar crystals and strawberry embeds nestled on top. Comes individually wrapped in a clear cello bag and is large enough to cut in half for multiple melts. **** Cute as can be and smells delicious! We combined our Sugared Cinnamon Sticks with a dash of vanilla frosting to create this adorable whippet.Fluffy whipped base topped with true to life wax teddy grahams and cinnamon sugar. Comes individually wrapped in a clear cello bag and is large enough to cut in half for multiple melts. **** We know what you are thinking... 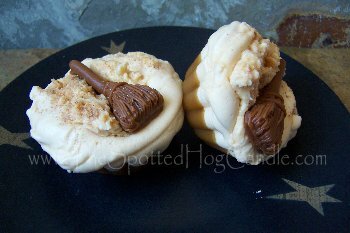 But we are a family friendly site so we will leave the rest to interpretation :) We were feeling a little nutty when we designed this whippet, we blended our Piggy Munch with rich caramel,toasted pralines and pecans. The end result equals pure heaven. Fluffy whipped green base topped with green sugar sprinkles and a happy little Hog. Enjoy! Comes individually wrapped in a clear cello bag and is large enough to cut in half for multiple melts. 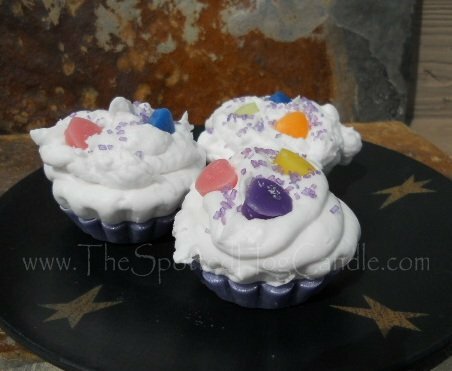 **** Whipped creamy frosted cupcake base with very realistic colorful fruit loops wax embeds and light sprinkle of purple sugar crystals on top. The base is scented in our best selling Birthday Cake fragrance and the Fruit Loops, is of course, scented in our Fruit Loops fragrance. When this melts, it is magical, first you smell the cake and frosting then it slowly combines and creates the most delicious aroma. We know what you are thinking, look again, it is all wax, but you would swear we really added the cereal. Individually wrapped. *** Fluffy cotton candy whippet layered in Pink, Purple and Blue. Reminiscent of the bags of fresh cotton candy you buy on the Boardwalk. Sprinkled with pink and blue sugar crystals.Comes individually wrapped in a clear cello bag and is large enough to cut in half for multiple melts. ** Puff, Fluff, Marshmallow stuff….. with sprinkles! Light and airy marshmallowey goodness with slight toasty campfire notes. Each one is whipped by hand and then hand formed to look like a gooey melted marshmallow and topped with raw sugar crystals. Package of 3. **** The King of Rock and Roll’s favorite treat. Marshmallow fluff, peanut butter sauce, ripe sliced bananas and sweet doughy goodness. This combination is simply divine. This whippet has a semi solid base, fluffy peanut butter cream whipped topping, handmade wax marshmallows and banana slices drizzled with peanut butter sauce. Dig in! This tart is large and can easily be divided in two pieces for multiple melts! Comes individually wrapped in a clear cello bag. **** The best part of the muffin! A mixture of sweet and tart cranberries baked in spiced muffins topped with cinnamon sugar,cinnamon butter and vanilla drizzle. No two are alike because each one is formed by hand. 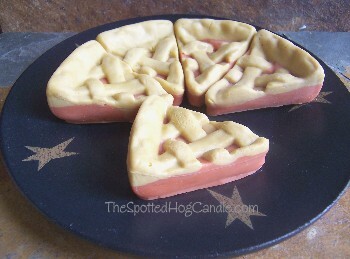 This tart is large and can easily be divided in two or more pieces for multiple melts! Comes individually wrapped in a clear cello bag. **** Nothing says "Good Morning" like warm blueberry muffins bursting with blueberries and smothered with butter. Topped with blueberries, cinnamon sugar and a drizzle of vanilla glaze icing. No two are alike because each one is formed by hand. 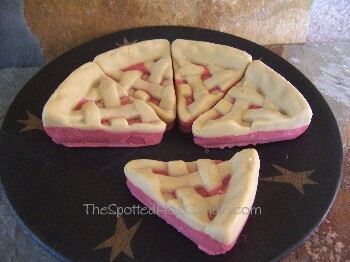 This tart is large and can easily be divided in two or more pieces for multiple melts! Comes individually wrapped in a clear cello bag. **** The best part of the muffin! Sweet apples and spices blended with delicious zucchini muffins. This muffin top is so realistic, topped with apple slices, cinnamon sugar, and a swirl of cinnamon butter .No two are alike because each one is formed by hand. 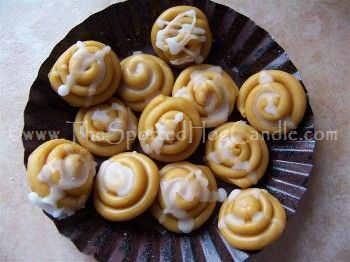 This tart is large and can easily be divided in two or more pieces for multiple melts! Comes individually wrapped in a clear cello bag. **** Delicious aroma of freshly baked butter cookies topped with a dollop of tart, ripe blackberry jam. Solid blackberry jam base and whipped butter cookie topping sprinkled with powered wax sugar, purple sugar crystals and black raspberry wax embeds nestled on top. This whippet is so beautiful you will not want to melt it. Don’t worry, we’ll make more! Comes individually wrapped in a clear cello bag. **** Marshmallow Fluff combined with sweet strawberry syrup and white cake. This whippet is a whipped pink cookie, drizzled with white, pink and red icing topped with pink sugar crystals No two are alike because each one is formed by hand. This tart is large and can easily be divided in two pieces for multiple melts! Comes individually wrapped in a clear cello bag. **** Little teddy bears floating on cloud 9 whippets.It does not get any fresher than this fragrance! Fresh clean air and aroma of all of the popular fabric softeners and laundry detergents combined to make one fresh, fabulous scent. 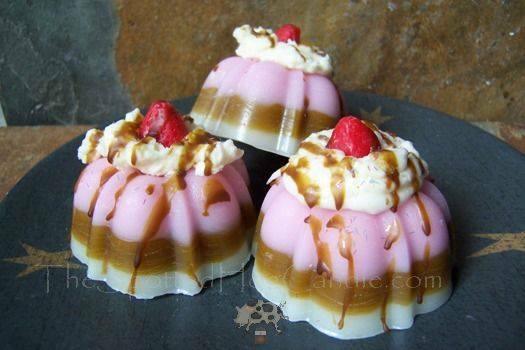 Comes individually wrapped in a clear cello bag and is large enough to cut in half for multiple melts. ****Limited Edition: Solid green colored base scented in our popular Doodlebug fragrance throughout the entire tart. 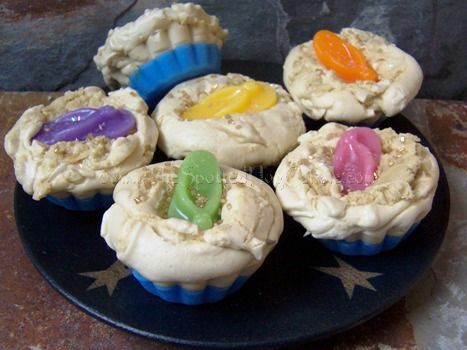 We hand whipped and formed the top to mimic a cupcake with loads of fluffy vanilla frosting. We then incorporated life size wax jellybeans, purple sugar crystals, pastel rainbow confetti sprinkles Perfect for spring and Easter. Come packaged in a Cello bag to preserve freshness and scent integrity. 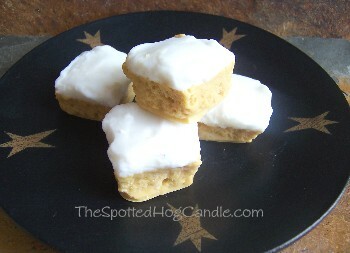 *** Little Pumpkins floating in Maple Cream Cake batter. The base is a blend of coffee cake, vanilla cream, cinnamon sugar, butter and maple syrup with tiny pumpkins scented in a house blend of pumpkin pie and vanilla ice cream! The tops are dusted in real cinnamon sugar. Individually wrapped. The BIG Frosted Sugar Cookie Tart! *** Huge 6 ounce Frosted Buttery Yummy Sugar Cookie with real rainbow sprinkles. Looks and smells so real you may try to take a bite out of it! We use a softer para soy blend to make these sliceable. Use an old butter knife to slice off as little or as much as you want, a little goes a long way. This Sliceable will give you 9-10 large tarts to slice off, as you need them. This is approximately 4 inches around, and weighs approximately 6 ounces. Comes packaged in a cello bag to preserve freshness. **** Limited Edition: Blueberry solid base topped with fluffy coconut frosting and hand grated coconut wax shavings, a touch of iridescent glitter and a mini blueberry embed nestled in the frosting. More perfume than bakery and it is super strong and delicious. Comes individually wrapped in a clear cello bag. 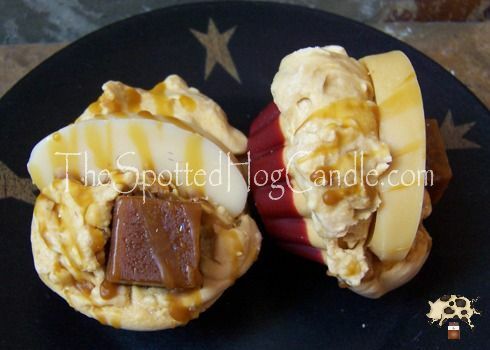 Drool worthy Carmel Apple Whipped Votives.Solid base with a fluffy whipped topping drizzled with carmel and a little apple slice (also dipped in caramel) on the top. No two are alike because each one is formed by hand. We have created these so they fit in any standard votive holder. They burn completely with no wasted wax and smell absolutely delicious! 2-2.5 ounces each, burn time of up to 15 hours. Comes packaged in a clear cello bag. Chocolate, Strawberry and Vanilla Ice cream layered together to make this famous frozen treat. Whipped marshmallow cream topping and chocolate syrup topped with a strawberry. No two are alike because each one is formed by hand. 2+ ounces each. Comes packaged in a clear cello bag. Cherry Crumble Cobbler Jumbo 3oz votive topped with Sinfully Vanilla cream and rainbow sprinkles with a cherry on top! No two are alike because each one is formed by hand. They burn completely with no wasted wax and smell absolutely delicious! 3-3.5 ounces each, burn time of up to 20 hours. Comes packaged in a clear cello bag. Limited Edition: Solid dark plum colored base scented in our popular Doodlebug fragrance throughout the entire candle. We hand whipped and formed the top to mimic a cupcake with loads of fluffy vanilla frosting. We then incorporated life size wax jellybeans, purple sugar crystals, pastel rainbow confetti sprinkles and added a cute little “pig tail” twist to the wick. This mini pillar smells so good you don’t even need to light it to fragrance a small area. Perfect for spring and Easter. Come packaged in a Cello bag to preserve freshness and scent integrity and tied with a black raffia bow. 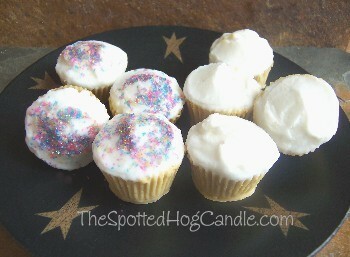 **** Pink sugar blended with our house blend wedding cake dipped in vanilla icing and sprinkles. 4 in a package. 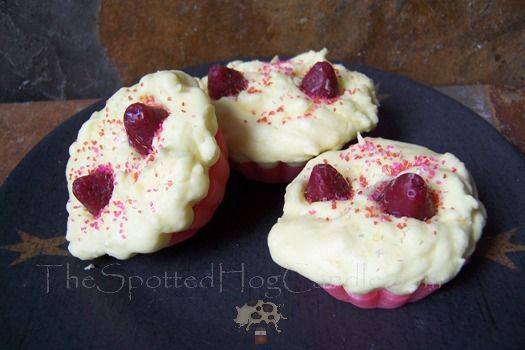 For a limited time only, It doesn't get any more adorable than this, SPOTTED HOGS Tarts! Large enough to break in two for multiple melts. 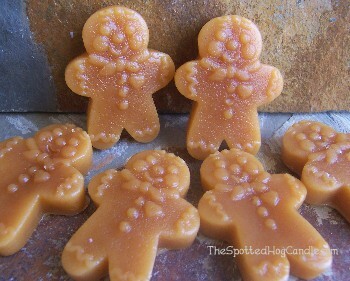 Cute little Gingerbread Men that look and smell just like the real thing! These will arrive packaged in tin tie bakery bag. 8 Yummy Cinnamon Rolls drizzled with icing.Size of a regular full sized tart. Comes packaged 8 in a bakery bag. A Spotted Hog Custom Blend~ The Aroma of fresh Krispy Crème iced pumpkin donuts will fill your home and make your mouth water! Packaged in a tin tie bakery bag, 13 donuts per bag. 4 actual sized oatmeal cookies drizzled with icing. 4 large Cinnabuns drizzled with vanilla icing. Net weight is approx. 5 oz per pack. Yes, these are super small, but that is what makes them SO CUTE! No two are alike!. 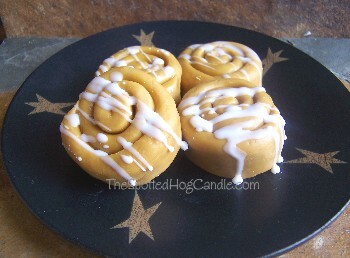 Heavily scented in our popular Iced Cinnamon Roll fragrance. Mix them with potpourri, pour them in a dish and set on your table or just oogle at their cuteness in the bag until you decide to melt them. Great for warmers with smaller dishes. You get one hundred and three mini cinnabuns, total net weight 5.6 ounces packaged in a bakery bag. 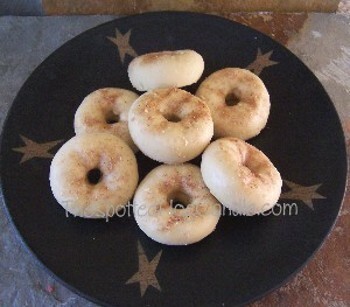 Mouthwatering cinnamon donuts! Each one is the size of an actual mini donut, hand rolled in real cinnamon sugar and comes packaged in a bakery bag! Fantastic gift for anyone! Mini apple pie slices with a lattice crust. Indulge in the aroma of spicy apple pie straight from the oven. Best in the State! Comes packaged in a bakery bag,9 pie slices per pack. The truest pumpkin pie aroma right out of the oven! For years we have searched for the perfect pumpkin pie and we have finally found it, hence “Perfect Pumpkin Pie”. Just the right amount of pumpkin, cream and nutmeg in a rich buttery crust. Each pie slice is 1.2 ounces and lasts about 14 hours. Comes packaged in a bakery bag,9 per bag. Each mini cake bite weighs .9 oz. Very realistic cake with all the nooks and crannies of a real piece of cake and yummy sweet frosting. Comes packaged 8 in a bakery bag. You may choose any fragrance you like from our list of over 290 fragrances. Mini Frosted Cupcakes look so real you just want to bite into them! You may choose any fragrance you like from our list of over 290 fragrances. Cupcakes weigh about .9 oz each and are packaged 9 in a bakery bag. Burn time is a minimum of 14 hours each ! 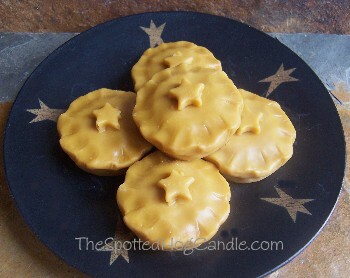 Each mini pie is topped with a star and weights 1.2 ounces each. Great for displaying in your kitchen. Comes packages in a bakery bag. You may choose any fragrance you like from our list of over 290 fragrances.